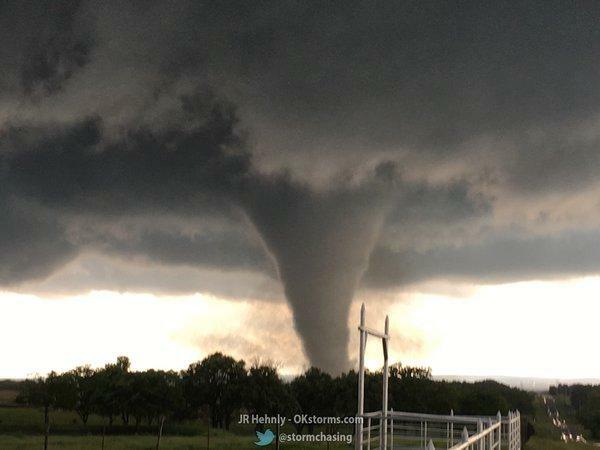 A tornado forms near Banner Road and Praire Circle in El Reno, Okla. on Friday, May 31, 2013. The Enhanced Fujita can underestimate the strength of a strong tornado that hits an unpopulated area. 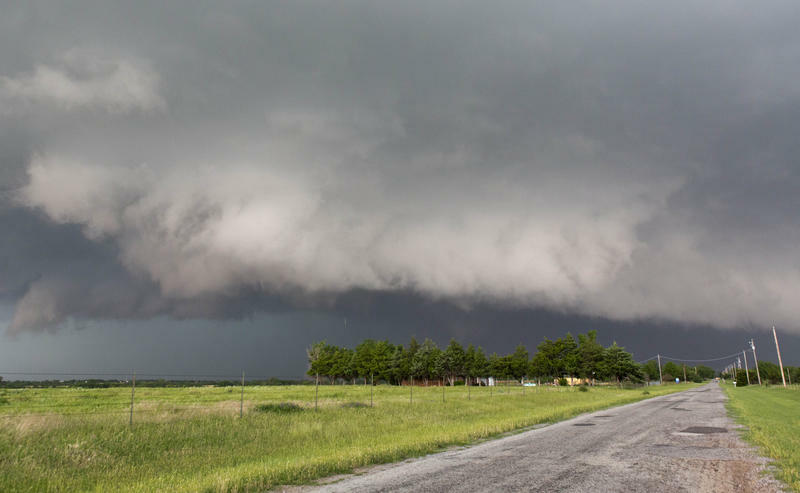 England says the 2013 Canadian County tornado was a “huge tornado” with wind speeds of at least 295 miles per hour, according to a RaXPol radar. 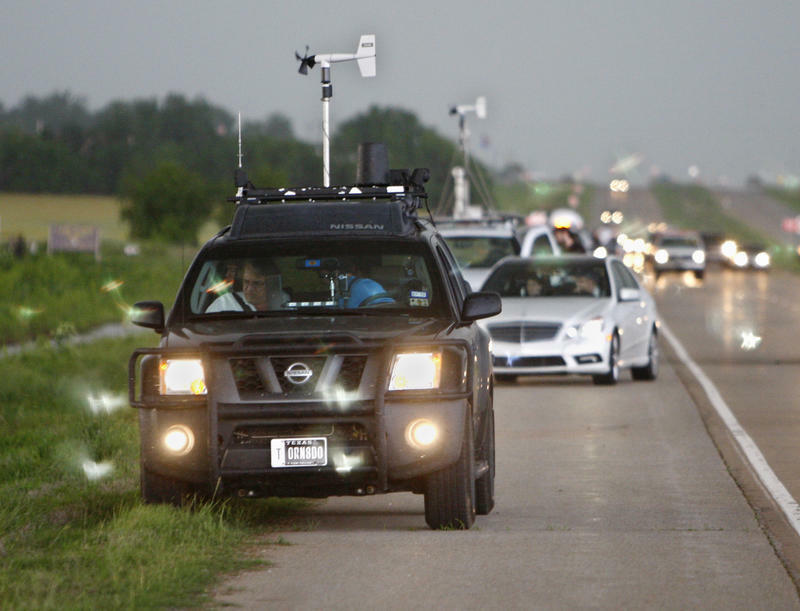 Doppler on Wheels measured winds of 200 miles per hour. The storm produced several accompanying tornadoes, and eight people died, all in vehicles. However, the tornado was rated EF-3 because few structures were damaged. “So there’s a problem with the database there. But now I think they have a quandary here because you have Doppler on Wheels right there and it measures 200, 250 miles per hour, but no buildings are gone so how do you classify it,” England said. Despite these issues, England says the Enhanced Fujita system has its uses. “One would be for the insurance companies. They look at, oh, we had an increase in hail or an increase in tornadoes in these particular areas. Is the frequency increasing? So they look at that, they look at a lot of other things, too,” England said. Gary England: Thank you, sir. Happy to be here. McCleland: So first of all, who decides a tornado’s strength on the Enhanced Fujita scale, that EF scale that we’re all so familiar with? 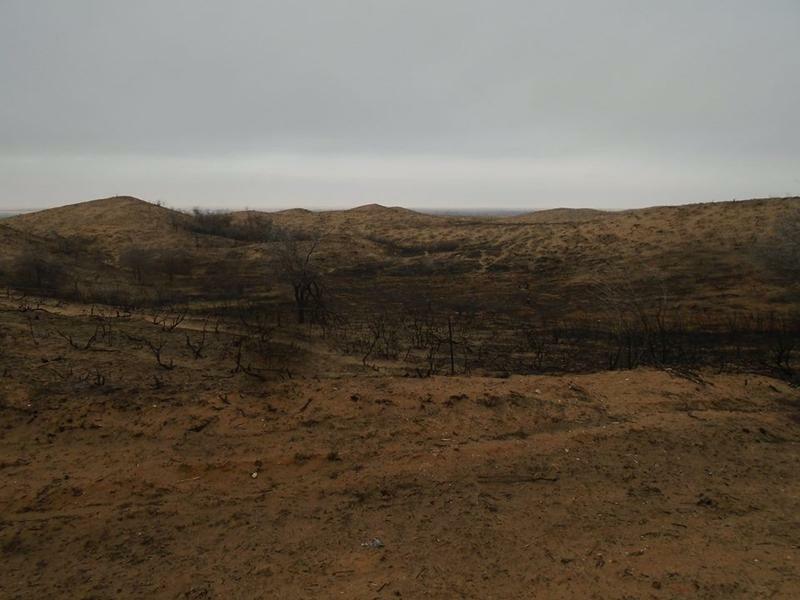 England: Usually National Weather Service people, people involved with the government, go out and survey and look at a storm and say, ‘Yeah, the house is gone. That’s an EF-5,’ or something. Now with the EF schedule now, with the strength of the tornado, you have to keep in mind it’s not a wind scale. It’s a damage scale. So what they do, people from the National Weather Service, Storm Prediction Center, all kinds of people like that and they’re good at what they do and they have computer in their hand and they can use the GPS, whatever, but they walk up and they can look at this and these guys are trained, guys and gals, are trained. They look at … They say, ‘OK, this house, this kind of damage. What wind will do that to it?’ So they look at the construction of the house, whether it’s brick, whether it’s wood, whatever it might be. As those people are out there on those surveys, they’re the ones that look at that. You may have a house right here just totally blown away, but the one right beside it, that had the same wind, it’s still there. So what’s that say? It says it depends on construction. But to answer your question specifically , it’s people out there, and they’re survey teams and they’re darn good. McCleland: So these survey teams, you said, they look at the damage, not necessarily the wind speed or anything like that. So, potentially you could have a really, really strong tornado out in the middle of nowhere that could have 200 mile per hour winds, we’ll say, that could be rated as a smaller tornado than one that hits a community and they’re more damage? England: You’re exactly correct. And that’s happened a lot. A big tornado out in the field there, Doppler on Wheels measured, 215 miles per hour, whatever it is. And it was in a wheat field, so it becomes an EF-1, EF-0 something like that. That happened with the Canadian County tornado in 2013. Huge tornado, and just all kinds of tornadoes around it. And wind speeds, you know, were probably 300 or so, and I think it was finally classified much lower than that because it didn’t hit many structures. So there’s a problem with the database there. But now I think they have a quandary here because you have Doppler on the Wheels right there and it measures and it measures 200, 250 miles per hour, but no buildings are gone so how do you classify it. I don’t know what they are finally going to arrive at. McCleland: Does it seem like there’s almost two different purposes for that? One for scientific purposes, to know what kind of wind speed and power was behind a tornado, and the other almost being more for governments and for public purposes to know what much damage is done. Does it almost seem there should be perhaps two different types of classification systems here? England: Noooo! No. With all the radar data they have and all the big storms, you know, they take that and they do research. But as far as just, ‘Did it blow Millie’s house away?’ and ‘What size tornado was it? How strong was it?’ They’re the folks who go out and make that decision. McCleland: So on the Enhanced Fujiti scale, the EF scale, do these classifications, in the long run, do they matter? Why are they important? England: They’re important for the statistics, so we know size of storms, what the norm is, what the usual happens. But other than just knowing Mabelle’s house blown away, everybody always wants to know whether it was an F-5, or an EF-F, and it’s not, there’s use for it. McCleland: And what are those uses? England: Well, one would be for the insurance companies. They look at, oh, we had an increase in hail or an increase in tornadoes in these particular areas. Is the frequency increasing? So they look at that, they look at a lot of other things, too. But that’s one way it’s used. McCleland: How rare are those big EF-5 tornadoes? England: Well for a few years around here it seemed like they weren’t rare at all. But they are rare. Maybe, what, tenth of … Maybe one percent or less of all tornadoes. They get the publicity. You have fifty little tornadoes out there the size of a football field, and you have a big one, everybody goes to the big one and that’s the impression that’s one everybody’s mind is, ‘There’s a huge tornado.’ Like I said, they get the publicity, baby. McCleland: We’ve been talking today with meteorologist Gary England. Gary, thank you so much. England: I appreciate it, sir.